Sample business closure letter to tax office. Company closing/wind up intimation letter to various government departments. I am writing to you because I would like to inform you that we would no longer be doing any business of any kind in the future starting from the first of next month. This is due to the company closing down. This company handled with providing schools and colleges all over the country books and equipment. However due to horrible circumstances we are having to close down the company because the company owner has recently passed away and he left no will and he sadly had no family to inherit it. I am the lawyer handling the case. This decision has come from the court. I hope that you understand and I am sorry for any of the inconvenience. 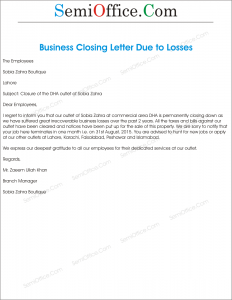 Sample letter of notification of office closing due to business losses to company employees, clients, customers and govt authorities. 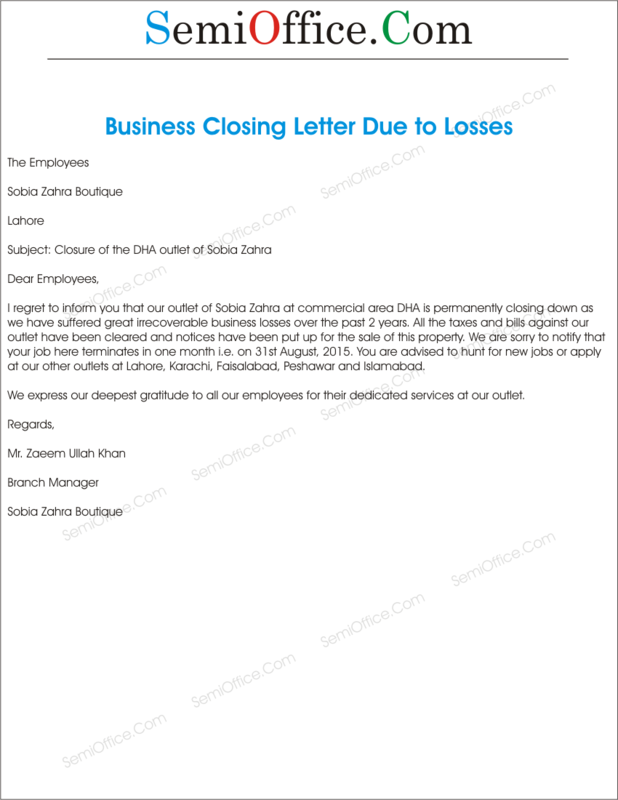 I regret to inform you that our outlet of Sobia Zahra at commercial area DHA is permanently closing down as we have suffered great irrecoverable business losses over the past 2 years. All the taxes and bills against our outlet have been cleared and notices have been put up for the sale of this property. We are sorry to notify that your job here terminates in one month i.e. on 31st August, 2015. You are advised to hunt for new jobs or apply at our other outlets of our company. We express our deepest gratitude to all our employees for their dedicated services at our outlet.